Run your entire servers infrastructure on a service with guaranteed uptime, high performance and simple management. Cloud Servers provide the neccessary infrastructure for your applications and services. The simple cloud control panel enables you to manage and run hundreds of servers. Starting a new cloud server takes less than a minute. Use Cloud Servers to deliver any application from web hosting. through running development tools and environments and especially when you need a flawless production environment for your ideas. Scale your servers horizontally by adding more machines in less than a minute. When success comes in the form of more resources needed, Cloud Servers provide the best, most flexible and economic way to scale. Adding more servers is simple and requires no upfront costs. Add more resources to your Cloud Servers by scaling up and down anytime you need. 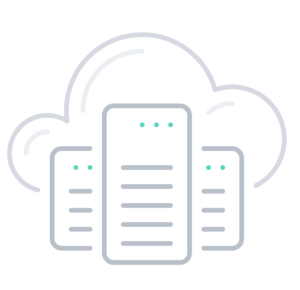 Vertical scaling is seamless with Cloud Servers, with no limitations on scaling down and service billing accurate to the second you can dynamically change workloads to deliver the best performance for you needs. Cloud Servers pricing is simple and clear. You pay only for the time your machine is using a certain amount of resources. There are no additional charges on bandwidth, data, disk operations or anything. All costs are listed in the table below. Select from a variety of operating systems for your Cloud Server. All preinstalled images offer base installation of the operating system with no graphical interface. Your Cloud Server arrives with full ‘root’ access over SSH. You can use any standard SSH client to access your new server. To connect to your new server, after starting it, wait for the initialization process to complete and get the assigned IP address. For Windows users, you can use any SSH client like PuTTY and create a new connection to “root@your.server.ip.addr“. You can resize your Cloud Server at any time. From the Servers dashboard in the Control Center, go to the server you want to resize. In the top bar you will find the resize button which will lead you to the server resize screen. There you can select the new size for your server. Resizing your server will immediately restart the machine! At any point you can rebuild your Cloud Server by starting it from a clean operating system image, or changing it’s operating system image. From the Servers dashboard in the Control Center, go to the server you want to rebuild. In the top bar your will find the “rebuild” button where you can choose the same or a new image. Rebuild requires you to set a new password for the “root” user. Rebuilding your server will ERASE all data on the root partition! You can add additional storage to your Cloud Server using Cloud Storage. Additional IPv4 addresses can be assigne to your server. Please contact support for more details.